Crafting the perfect pour over shouldn't be perplexing! 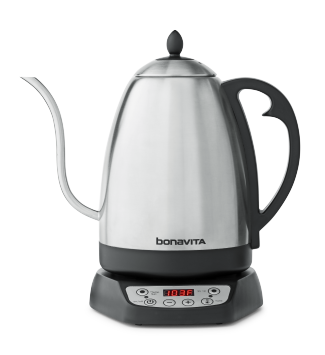 The Bonavita 1.7L Variable Temperature Electric Gooseneck Kettle makes heating water to precisely the right temperature, and maintain that temperature for up to one hour, easier than ever. The gooseneck spout provides maximum water flow control, while the lid release button makes one-handed filling possible. UL Rated - This kettle is both household and commercial UL rated, meaning it is safe to use in both a home and commercial setting. Temperature Options - Easily choose from one of the six pre-set temperatures, or choose your own precise temperature and the Bonavita Variable Temperature Gooseneck Kettle will automatically heat to that specific temperature the next time you turn the kettle on. Handy Timer - Once the kettle is heated and you are ready to begin your pour over, lift the kettle off the base and this variable temp kettle will give you the option to start a count-up timer. Press the + button to begin the timer and place the kettle back on the base and lift back off to reset the timer back to zero. Now available in a larger 1.7L size, versus the previous 1L version. This larger kettle also features a handy lid release button for easy filling and convenient water level indicator so you know when its time for more agua.